Join us and over 70 wineries from all over California under ancient oaks and among the vineyards. 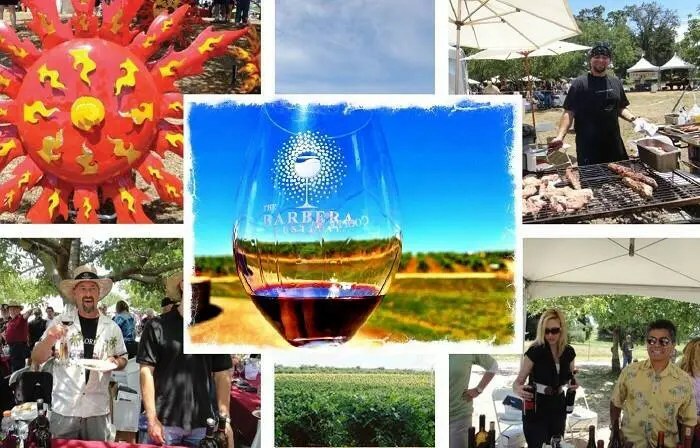 Wineries from regions including the Sierra Foothills, Paso Robles, Napa, Sonoma, Mendocino, Livermore, Ventura County, Lodi and the Bay Area, will pour their barbera wines for over 2,000 in attendance. Top area chefs prepare gourmet food. Four tents of art and artisan crafts. Live Music. Ticket includes admittance, wine tasting, and commemorative wine glass. Food, provided by top restaurants and caterers, sold separately. Beer and white wines also available for purchase. Free parking available on-site. Event will be held rain or shine. Tickets are non-refundable*. This event is being held among working vineyards and orchards. Please wear comfortable shoes. No outside food, beverages, or coolers. No pets other than service animals allowed. This is a Green and a No-Smoking event. *Should the event be cancelled, the liability of the organizers, venue owner, and county will be limited to the refund of any funds paid. The organizers, venue owner, and county are not liable for any consequential losses, damages, or attorney fees. Ticket purchases are not tax deductable as charitable contributions.